These images represent a few of the many shapes of fabric cornice boards available. We will custom make any shape or style to your specifications. See below for further information. These prices DO NOT include face fabric. 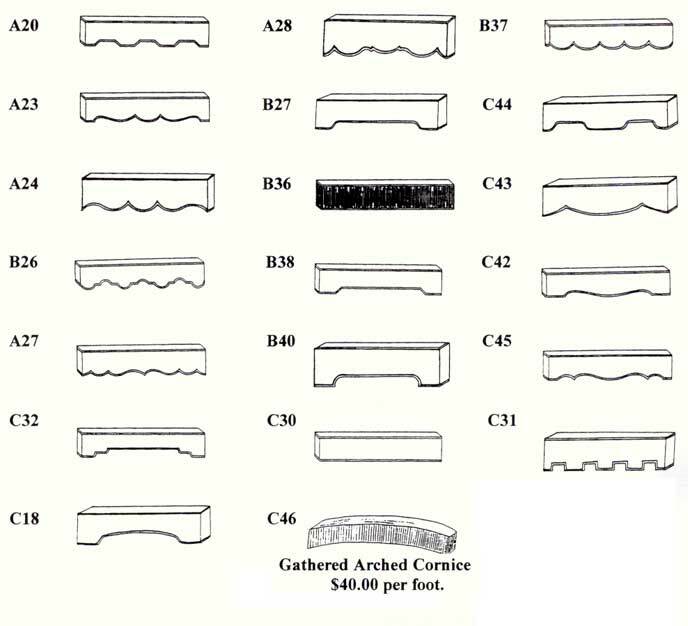 Custom Cornices are made to customers exact specifications. The line drawings above are examples of fabric covered cornice boards. We will customize them to any size, shape, height, length or design using Customers own Material or fabric supplied by Interior Mall. Various materials and fabrics can be used to create folds, gathers, swags and numerous other effects for a one of a kind creation. We also provide bulk quantities for large commercial projects. Custom cornices will have self cording (same as face fabric) as a standard at the bottom and top unless specified otherwise. Call 1-800-590-5844 and talk to one of our experienced decorators for help with design and pricing. 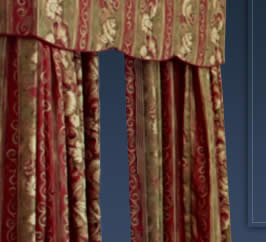 Typical delivery for custom fabric covered cornice boards varies but is approx. 2 to 4 weeks from receipt of fabrics. Call 1-800-590-5844 or email us for ordering assistance.